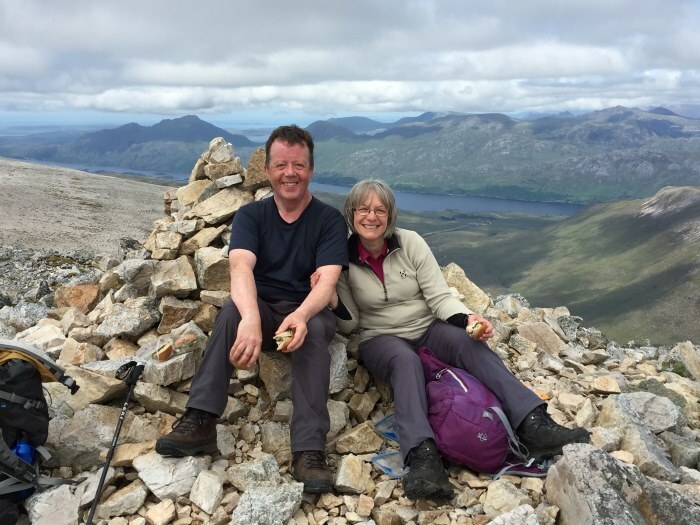 It was around eight years ago that John and Jeanette Fenwick sold their house in order to retire to the West Highlands of Scotland. The idea for a self build only came about when they couldn't find anything on the market that they wanted to move into. 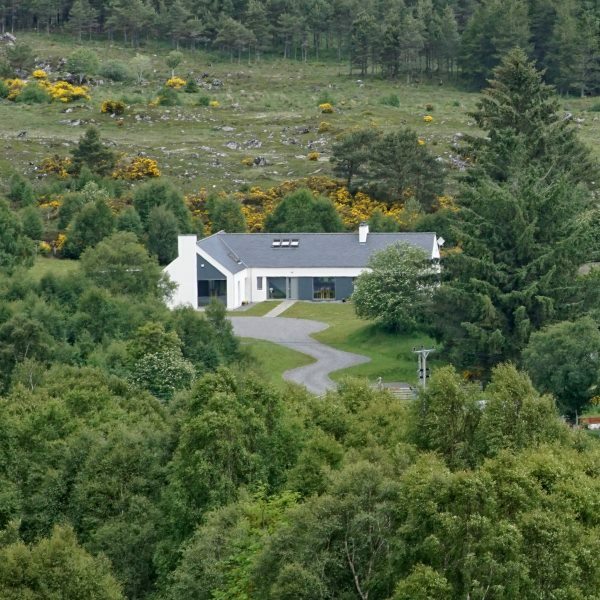 The large plot they bought looks out onto Ben Wyvis and was originally crofting land that was overgrown with birch, and quite boggy in places. Their intention had been to build a kit home but weren't sure how they would get a builder for it or how to take it to planning. 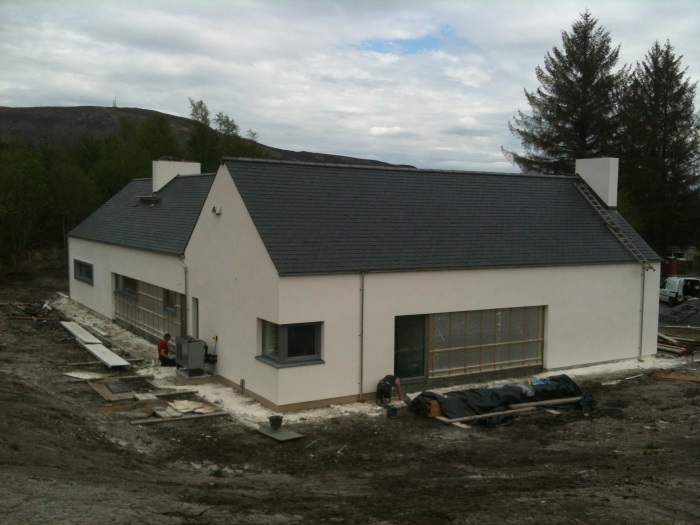 It wasn't until they attended a Housing Expo in Inverness in 2010 that they came across Passivhaus buildings. After speaking with the consultant there, and later the architect that had designed the Passivhaus Terrace for the Expo, they decided that this would be the route forward. 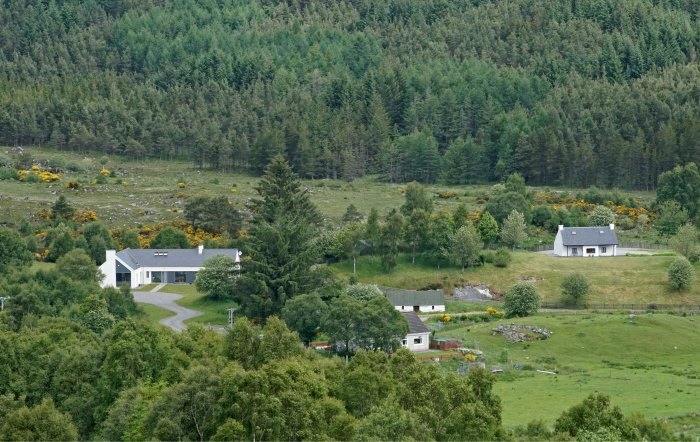 Key to their plans for Tigh na Croit was a single storey dwelling that would reflect the traditional steading style of building in the area. 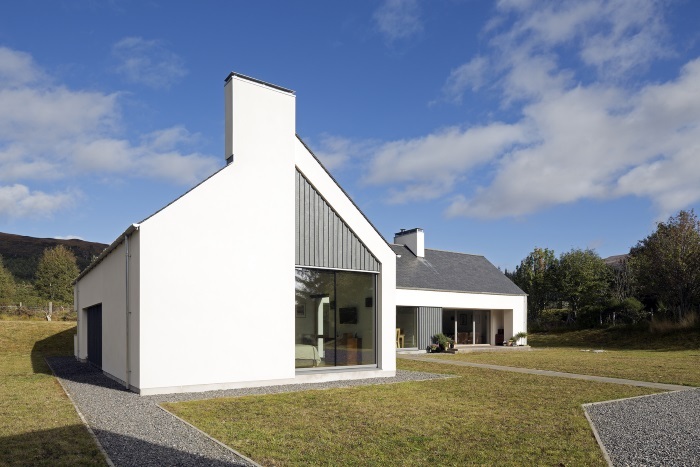 The ‘L' shape of the design came naturally with one length of the house incorporating daytime accommodation and the other length housing the bedrooms. John explains that ideally an MVHR unit would be at the centre of a house so that the system is balanced, with everywhere being treated equally when it comes to ventilation, heat recovery and heat distribution. In Tigh na Croit, the ventilation equipment is at the corner of the ‘L'. John has installed sensors so is aware of the temperature differential between the recovered heat that is distributed closest to the ventilation equipment (30-35 degrees), and those rooms at either end of the building (23-24 degrees). To get through the harsh winters the living room at one end of the ‘L' has a Passivhaus certified stove, and the main bedroom at the other end of the house has a heated mirror-like far infrared panel. 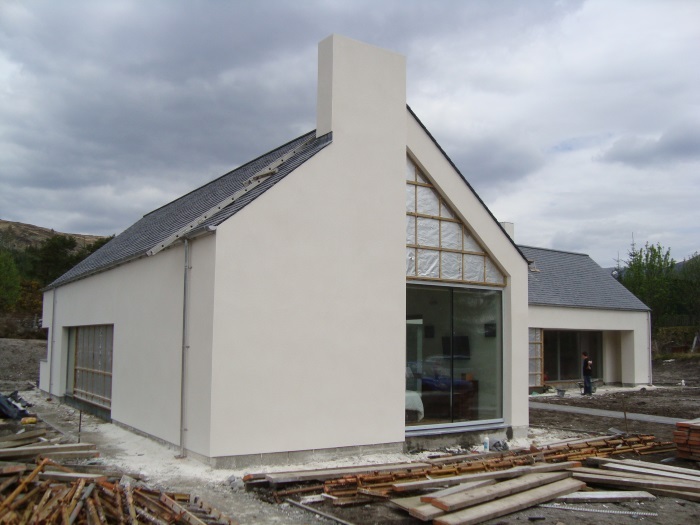 Together with a water-based post heater supplied by an air-source heat pump, they provide the main heating to the house. Additionally the air-source heating circuit powers three small towel rails in the bathrooms. 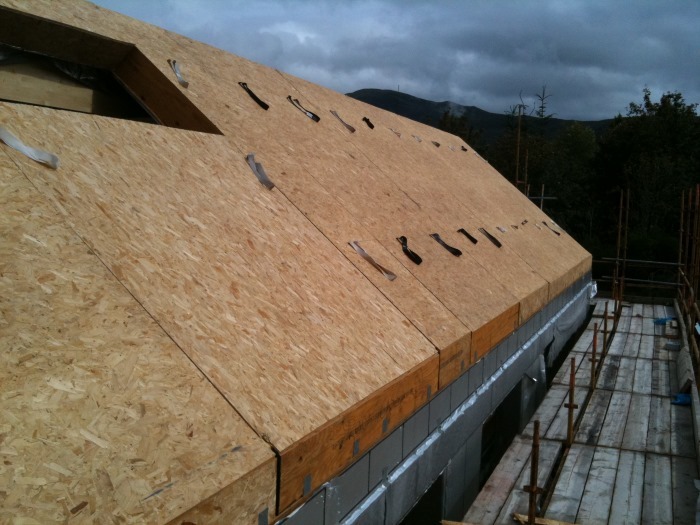 OSB panels are pre-filled with insulation, pre-membraned and put together like a timber frame to create the airtight envelope. The finish gives clean lines inside the house and with three double-height spaces within the floor area they were able to achieve an attractive effect using the closed panels for the walls and for the roof. 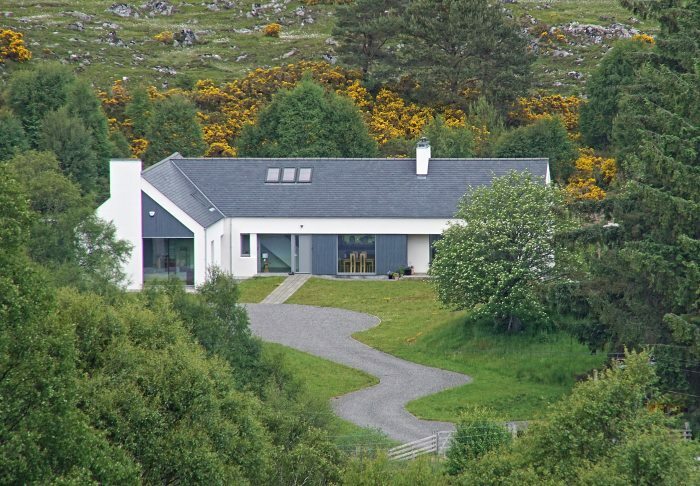 Building in the Highlands anyway was a big challenge with there not being a great many builders to choose from, and the fixed-price contract deterred a few from tendering. One local company agreed to take on the contract and sub-contracted out many of the trades. As they were living 300 miles away, they employed the architect on a traditional contract where he would visit the site once a month. Being able to communicate with the builder and know which days he had been on site was very difficult to monitor from such a distance away. With the builder invoicing monthly, and John only able to visit every six weeks or so, he would sometimes arrive wondering what work had actually been carried out since his last visit. 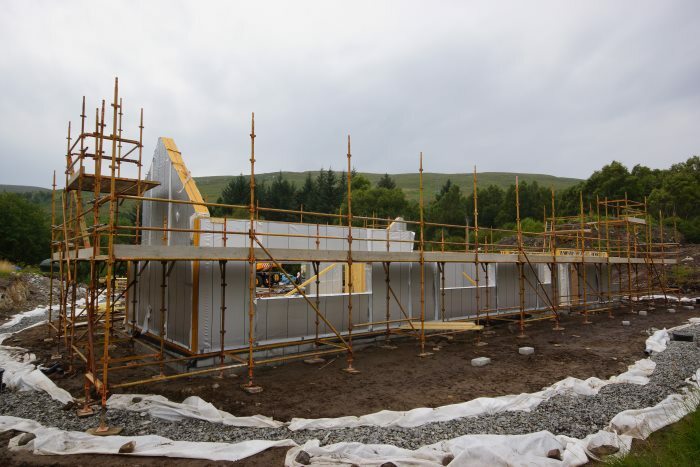 The contractor's lack of attention to detail and knowledge of what was required to achieve the Passivhaus standard meant there were some frustrating delays. They found a fist-sized hole where air was getting in and in areas where airtight foam had been specified, the builder had used standard building foam because he hadn't been able to get the correct one at the local builders' merchants. John and his wife did debate whether or not to install underfloor heating, and believe they made the right decision not to go ahead with it. 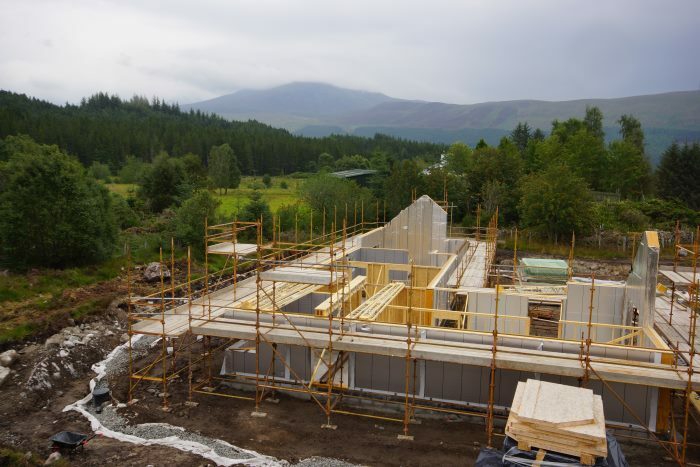 Being a Passivhaus would have a beneficial effect in that the underfloor heating wouldn't be worked as hard as in a standard home, but the problems arise when the house is suddenly flooded with sunshine and can become difficult to cool down, as underfloor heating takes a few days for the effects to wear off. Even being a Passivhaus there are times when the heating needs to have a bit of a boost. This is particularly the case if the house hasn't been occupied for a period of time. Generally though they manage to maintain a temperature of around 18 degrees which, without drafts, they find comfortably warm. Perhaps the one thing they would change if they did it again would be their bedroom window. It's a very large picture window that is triple-glazed, but despite the quoted u-values, isn't as insulated as a wall would be so does feel cool and will inevitably lead to a temperature decrease in the room. Finding blinds to fit it has also been one of the biggest challenges they've faced! John thinks the house naturally settles at a temperature of around 15 degrees warmer than outside. John has experimented with switching the MVHR unit off overnight in the winter and found that it doesn't make a great deal of difference. Visit the website of HLM Architects. Download a transcript of the interview with John Fenwick. We have the best resources for chicago event planning buy nexium online canada you..